THE FIRST HYBRIDS, THEN THE MOST RECENT. The hybrids creation began a few years after the discovery of S. truncata, when it started to be grown and exported to Europe. From the second half of the 19th century, many cultivars were already available, often created in England. S.X "buckleyi" are bigger. Resemblance to S.russelliana has frequently provoked a confusion between the two plants. S.X "buckleyi" blooms from December to January, and even February, it is one of the last blooming hybrids. bulky size, and the stem bottoms became lignified. It's the Christmas cactus which was common during my childhood. I think this is the one commonly called "the genuine" Christmas cactus by some people. It's now quite impossible to find it in garden centers. Since then, lots of cultivars have appeared, created in the United Kingdom, in Germany, in Denmark, in the Netherlands, and since the 1960s in the United States and in Australia. I particularly think of the hybrids created by Joyce Carr, among which we can find intergeneric hybrids between Schlumbergera and Disocactus. Joyce Carr's hybrids are very difficult to find. Among my favourite hybrids, I will quote S.X "White Christmas" marketed in the United States in 1973 and S.X "Bridgeport", marketed in 1988, still in the United States ; this plant is also a white blooming Schlumbergera whose white rounded flower petals’ shape is absolutely unique. S. X "White Christmas" ............................................................S. X. "Bridgeport"
The pale pink shade of these flowers, normally white in all catalogs, is due to the fact that I didn't keep the temperature constantly over 15°C to grow the plant from the flower buds formation to complete blooming. This is an essential condition to obtain pure white flowers. BIRTH OF SCHL. X "GOLD CHARM", THE FIRST YELLOW BLOOMING SCHLUMBERGERA. A huge step in new hybrids creation was achieved when creating S.X ‘Gold Charm’, the first pure yellow blooming Schlumbergera. (That is, when it is grown in a temperature constantly over 15°C ; otherwise, the pure yellow color is mixed with pinkish zones ; besides, as the below photograph shows it, this is a very beautiful mixture). Between the moment when the hybridizer and producer Cobia (from the United States) had the idea to carry out this creation and the year when the plant was marketed on the US market, 15 years of patient and thorough research had gone by. The success appeared all the more delicate since, before "Gold Charm", the yellow color didn't exist for any Schlumbergera. 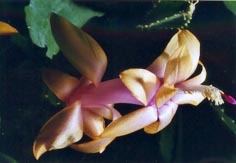 The closest to this yellow shade, were Schlumbergera with orange-coloured blooms. So, the main idea was to favour the yellow colour genetic material (contained in the orange colour) to the detriment of the red colour genetic material (also present in orange colour). 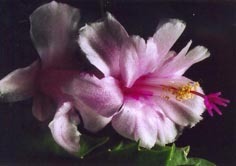 In practice, pollinations were made with orange-coloured blooming Schlumbergera, and 50.000 resulting seeds were harvested, sown, and the plants were grown until they bloomed. Among all these plants, one appeared which had a pure yellow bloom. But, unfortunately, this plant was weak and the vegetative aspect was commercially unacceptable. It was therefore decided to cross this plant with white blooming and with vigorous growth Schlumbergera. This crossing produced one fruit containing 200 seeds which were sown, and the plants were once more grown until they bloomed for assessment. Among 150 plants which had yellow flowers, only one was selected ! Schlumbergera X "Gold Charm" was born. It was the first of many yellow blooming Schlumbergera. Schlumbergera orssichiana..............................................................Schlumbergera X "Bristol Queen"
Schlumbergera orssichiana was discovered in the Brazilian forests in 1978, i.e. more than 150 years after S. truncata and approximately 140 years after S. russelliana. Its discovery led the Christmas cacti hybridization into a new direction. Beatrix Orssich was the first one who, in Brazil, started to cross S. orssichiana with S. truncata. 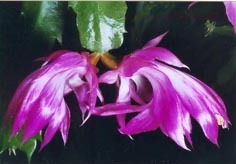 Thus, she obtained new hybrids with much larger flowers than those of all known before Schlumbergera. Moreover, the bloom shape was different, with a shorter tube and petals with sometimes a dishevelled aspect. They are "Queens" she said. 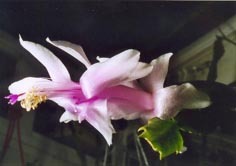 That’s how the word "Queen" appeared in the first hybrid published by McMillan in literature: Schlumbergera X "Bristol Queen" (photo above). This hybrid was followed by many others, often including the word ‘Queen’ in their name. Several of these hybrids, still difficult to find in garden centers or even from cacti producers, are in my collection. They are easy to grow, they prefer a little more shaded location than other Schlumbergera. They abundantly bloom at the beginning of September. In my opinion, their name "Queen" is really well deserved. Many thanks to Beatrix Orssich and to A.J.S. McMillan who created and developed the first ones. THE PHOTOGRAPHS OF ALL MY SCHLUMBERGERA. 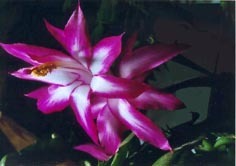 You will find the photographs of all my Schlumbergera in the September to February galleries. They do not appear under the name of Schlumbergera but under that of Zygocactus (shortened as Z.) 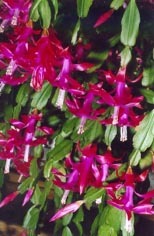 which is sometimes used as a synonym for Schlumbergera. (See note below). September gallery : 8 Schlumbergera photos. October gallery : 11 Schlumbergera photos. November gallery : 16 Schlumbergera photos. December gallery : 13 Schlumbergera photos. January gallery : 7 Schlumbergera photos. RECAPITULATIVE GALLERY OF ALL MY SCHLUMBERGERA PHOTOS FROM 2002 TO 2010. N.B. In my names of photos, I use both names: "Schlumbergera" and "Zygocactus". Although the first is more accurate, botanical or hybrid Schlumbergera are often known under the name of Zygocactus, in reference to the zygomorphic shape of their blooms. "Zygocactus (Schlumbergera)" A Comprehensive and Practical Guide For the Weekend Gardener’ by Mark E. Cobia. All the photographs result from plants of my collection, plants which I've been photographying for several years. My article contains only a very small part of the fascinating information given by these two books. I strongly advise all Christmas cacti lovers to read them.